I used to be an avid camper. Like most others I went the upgrade route; first a tent, then a pop up, and then a fully self-contained travel trailer. With the advent of front wheel drive cars, trailer towing was not recommended at that time. That prompted the sale of my trailer and the end of my interest in traveling. I do not like staying in hotels no matter how fancy they are. You lock and bolt your doors and there is no interaction with any of the other guests. At a campground you are always meeting new people, sharing stories, and are in a friendly open environment. With the passing of my wife and now that I am retired, my son encouraged me to get back into camping. 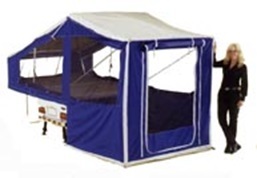 I have a tent, and while it is more than comfortable, setting it up by myself is quite challenging so I started looking at pop up trailers. My vehicle only has a 900 pound towing capacity limiting my choices. At a camping outing, a fellow camper pulled up on a motorcycle and towing what appeared to be a utility trailer. Surprisingly this thing folded out into a full-sized pop up camper. It only weighs 320 pounds which is well within the limits of my vehicle. I was sold and bought one. 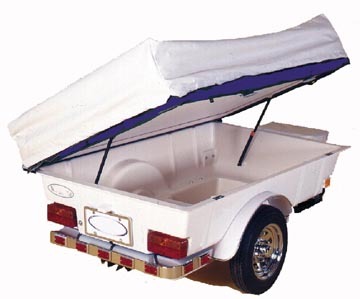 The king sized bed sets on top of the trailer off the ground and can easily sleep 3 adults. The 6’x6’ tent area easily accommodates a portable camp kitchen and my 110 pound dog with room to spare. The tent folds up on top of the trailer leaving it for storage. I have all my pots and pans, a camp kitchen, an E-Z up screen room, tools, and sleeping bags stored in mine. The storage area is accessible while on the road as well as when it is set up. Setting up is an easy one man operation. Here is a Youtube video showing how easy it is. [ click here]. Its unique design is an attention getter. I have yet to camp without someone asking to check it out. I even had a fellow follow me into a rest stop to check it out. This entry was posted in Title and tagged Aspen Classic, camper, camping, motorcycle, motorcycle tent, trailer, Trailmaster. Bookmark the permalink.